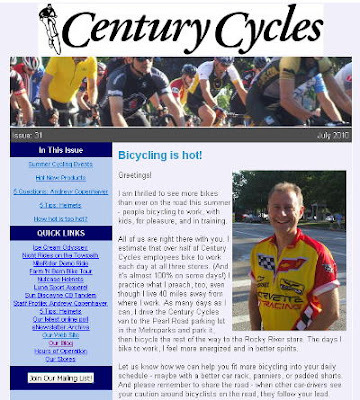 Summer Cycling Events such as the Medina County Bicycle Club's Ice Cream Odyssey, our Night Rides on the Towpath Trail, the MS150 Pedal to the Point, and the new Farm 'N Barn Bike Tour. Hot New Products like helmets from Nutcase, women's-specific clothing from Luna Sports, and the Sun Biscayne CB Tandem bicycle. Our Latest Online Poll: How hot is too hot?